At Meneage Dental in Cornwall, we’ve seen how cosmetic dentistry treatments can dramatically improve the smiles and confidence of our patients, as well as improving their oral health. We believe that teeth straightening, whitening or tooth replacement can be one of the wisest investments you ever make for your health and wellbeing. However, there are several cosmetic dentistry myths that persist and hold back some of the people would could benefit from it most. So here we’ll discuss and debunk them! 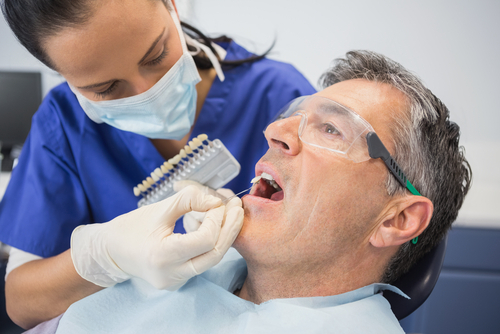 Many people are afraid of the dentist for a range of reasons. There’s no reason for cosmetic dentistry to be any more scary than other treatments though. We use the latest techniques and technologies to make visits relaxing, and many treatments, such as teeth whitening are non-invasive. The enamel layer of your teeth contains no nerve endings after all, so there is little to be afraid of when it comes to tooth whitening for a start. Even the more involved treatments, such as dental implants, will include anaesthetic if minor surgery is part of the process. You’ll often find that this dentistry reduces your pain, rather than increasing it! Not necessarily! Cosmetic dentistry is a very broad term, and treatments like tooth whitening can be low-cost. The price of treatments must of course be weighed up against the numerous benefits of greater confidence, reduced pain and your dental health. If you do find the cosmetic dentistry cost to be too much to pay in one go, there are often payment plans available for you to pay in instalments. The long term benefits of any cosmetic dentistry treatment depend on the type of treatment and on your lifestyle choices. Othodontics (teeth straightening with braces) is designed to permanently alter the configuration of your teeth, so could well last a lifetime. Your teeth may shift somewhat down the line, in which case they can be again encouraged into place with further short-term use of braces. The effects of Teeth Whitening treatments can, in theory, last forever, but it’s really down to your consumption of red wine, coffee and other foods and drinks (and smoking) that could darken your teeth again slowly over time. However, regular brushing should maintain your results for many years. Dental Bridges and Porcelain Veneers might typically last for 10 to 20 years. The word ‘porcelain‘ makes many people think ‘fragile‘, but this is not the case – and just part of the myth! Dental Implants we often say to expect 10 years, but studies have shown that most are still working perfectly well after 20 years, and many last a lifetime. This myth comes straight out of Hollywood – those glowing white smiles on TV and film stars that do indeed look fake. However, a good dentist will work with you to ensure that teeth whitening, crowns, veneers or implants offer you a natural white smile – not leaving you teeth so dazzling that they hurt the eyes of everyone who meets you. At Meneage Dental, we love helping people to improve the appearance of their teeth and their overall dental health, and to have the confidence to smile freely. If you are interested in cosmetic dentistry in Cornwall, why not contact us for an informal discussion of your needs?